Beyond the overlook at the end of the park road east of Rio Grande Village, Boquillas Canyon encloses the Rio Grande for 20 miles, as the river flows beneath cliffs up to 1,600 feet high, mostly inaccessible except by boat. The only other section reachable by hiking is a mile-long stretch a little way north, destination for the 14 mile (loop) Marufo Vega Trail, perhaps the most strenuous day hike in the park - it crosses exposed, rocky terrain of canyons, cliffs and plateaus largely without shade, lacking any source of drinking water, and experiencing high temperatures, often exceeding 100°F as early as April. The cumulative elevation gain for the whole loop is about 2,150 feet. 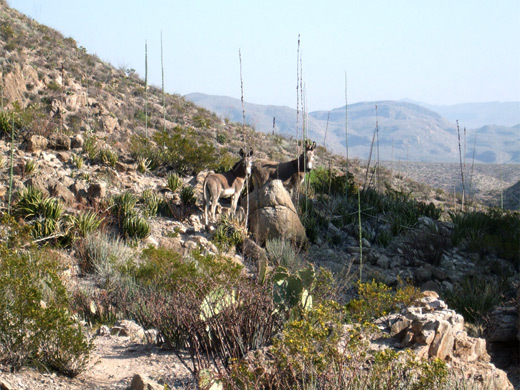 Rewards for the hike are solitude, exceptional views over the high peaks of Sierra del Carmen and the Dead Horse Mountains, especially varied and abundant cacti, a good chance of spotting wild burros and other Chihuahuan Desert creatures, and Boquillas Canyon itself, where the Rio Grande flows serenely through a narrow corridor of vegetation enclosed on both sides by rugged, multi-layered cliffs and benches, like a smaller-scale version of the inner Grand Canyon. 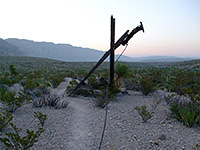 An added feature along the first part of the route is the remains of a tramway once used to transport ore to a processing plant from its source in a mine south of the river in Mexico. 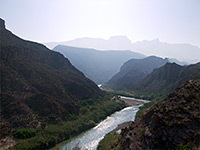 Although a day trip on the Marufo Vega Trail is quite possible, many people prefer to hike on a backpacking trip, spending one night beside the Rio Grande, in which case a permit is needed (cost $10). Marufo Vega Trail topographic map, Big Bend National Park location map. 18 views along the Marufo Vega Trail; gallery, slideshow. The Marufo Vega trailhead is 3 miles east of Hwy 118 and Rio Grande Village, along Boquillas Canyon Road - opposite a small pullout on the south side, and just past a side road to an overlook of the canyon. A sign warns about frequent vehicle break-ins, since the parking area is secluded, and Mexico is less than half a mile away. The trailhead also has a cautionary notice, about the high temperatures, lack of water and rough terrain. Besides Marufo Vega, two other trails start here - Ore Terminal, a 2 mile (one-way) path to the end of the ore tramway, and Strawhouse, a lengthy backcountry route leading along Ernst Valley into remote Telephone Canyon. The trail is fairly well marked by cairns, reasonably well defined for all the 14 miles, and clearly signed at intersections. It soon descends into a sizeable dry wash, follows the streambed for a while then climbs slightly up the far side to the course of the ore tramway - a thick iron cable runs southeast-northwest along the valley floor, with remains of wooden supports at intervals, a few still partially upright. After returning to the streamway, the path reaches the first junction; the Ore Terminal Trail continues straight on while Marufo Vega Trail turns right, leaving the wash and crossing the valley towards a distinct gap in the cliffs to the east, climbing gently at first then rather more, up to a saddle between two steep hillsides. 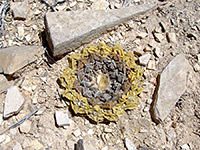 The ground hereabouts is grey limestone, covered by cacti and small yucca, and split by veins of brownish calcite. The path divides again at the saddle, the left branch being the Strawhouse Trail that has a short descent back into the wide, stony wash which is followed for many miles northwards, eventually linking with Telephone Canyon. Two further junctions are passed in quick succession, the second with a connecting route back to the Marufo Vega Trail, bypassing a steep section, since the right fork at the saddle ascends very sharply for 1/4 mile by 300 feet, over rather unstable ground with loose rocks, up to the top of a plateau. The next mile is over undulating, hilly ground bearing many more desert plants, and giving wide ranging views of high, hazy cliffs to the north and east. The path descends a little to the junction with the alternative route from the Strawhouse Trail (better for horses), and soon drops down further into a narrowish rocky wash, which is then followed northwards for a mile. The route is mostly along the streambed but rises above in some places to pass boulders and dryfalls. The limestone hillsides around the wash are home to many and varied plants, often with a dozen or more different cactus species within a few yards, including varieties of apuntia, ariocarpus, mammillaria, ferocactus, coryphantha, echinocactus and echinocereus. The trail arrives at a junction near the upper end of the wash, marking the start of the loop section into Boquillas Canyon along the Rio Grande - the north fork has a slightly more gradual descent, through a deep ravine that gives plenty of shade in the morning, while the south fork stays on high ground for longer then drops more steeply over open slopes with no shade, but the clockwise direction (north fork) seems to be preferred, as that reaches the river soonest. This branch of the path rises a little more up a side drainage, passes over a saddle and enters the upper end of the ravine which leads all the way to the Rio Grande. The descent is steep at first, down quite a narrow and enclosed part of the drainage, before the canyon opens out and the cliffs at either side (part of the Sierra del Caballo Muerto, or Dead Horse Mountains) become sheer, over 1,000 feet tall. 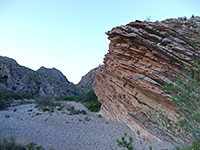 The trail rounds a wide bend in the canyon, passes a protruding rockface and is then fairly level, traversing open, bushy land, as the Rio Grande comes into view. The last part descends gently, crosses a stream and reaches the sandbanks bordering the river. Several faint paths branch off in different directions, used by the wild burros that inhabit the canyon, but the main route turns east, staying close to the river for another half mile or so, across a few small side drainages and along bushy flats, before beginning to climb, to keep above the low cliffs that rise up next to the river. 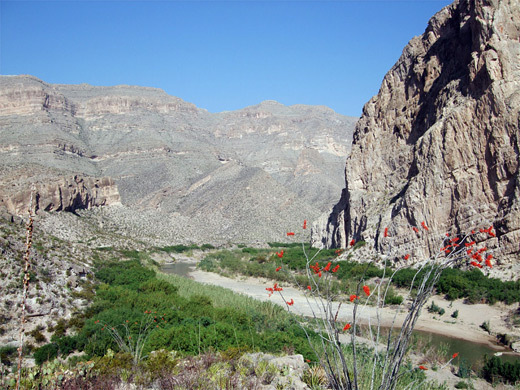 Cliffs on the Mexican side of the Rio Grande are much steeper, but still the canyon is not particularly confined, wide enough in most places for a band of trees and bushes to grow along both banks, and the greenish water flows quite slowly owing to the gentle gradient. Further up the rocks rise a long way, up to 1,600 feet in a series of cliffs and terraces, all bare rock in shades of red and gold, usually enveloped in a heat haze causing the more distant cliffs to appear markedly less distinct. The trail climbs to a bench about 200 feet above the river, and stays at this level until the junction with the south fork path, from where a half mile spur drops back down to the Rio Grande. The best views on the whole trail are around the junction, where a fantastic mixture of river, desert and mountain scenery extends for many miles in all directions. The lower end of the south fork is the steepest section of the route, gaining 800 feet over half a mile, in a two part ascent, firstly up a slope to a bench above the inner canyon, followed by a slightly less steep climb to a wider plateau higher up. The path then remains quite level, running along the base of the next series of cliffs before turning away from the river up a valley, over flattish land for a while and down into a wash, eventually arriving back at the junction with the north fork, from where the trailhead is 3.5 miles away.